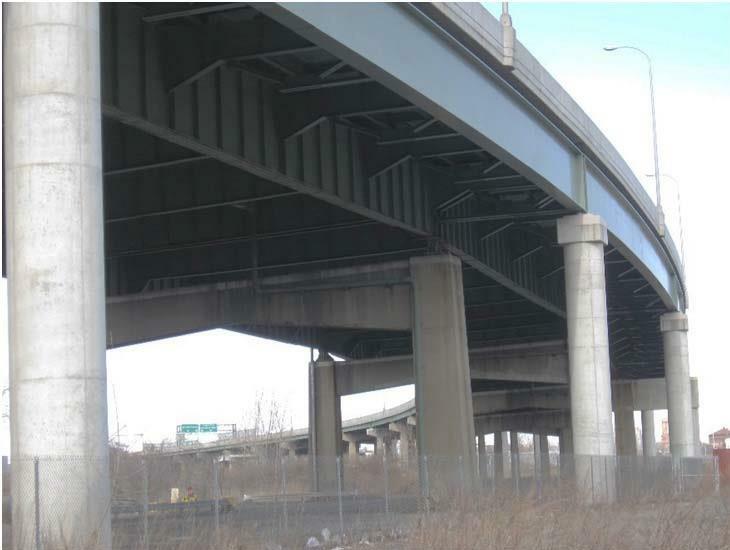 As sub-consultant to Greenman-Pedersen, Inc. (GPI), AEA provided structural design services for the Newark Bay-Hudson County Extension, Mile Post N6.00 to N8.20 – Bridge Deck Reconstruction and Miscellaneous Improvements project. AEA performed load rating analysis of the existing girders for the existing and proposed deck conditions for the twenty-two (22) spans of the Structure No. N 7.93W, seven (7) spans of the Structure No. N 6.80W and three (3) units (continuous three spans for each unit) of the Approach Ramp A structure using MDX program. Performed proposed deck slab & overhang design and negative moment region reinforcements design for the continuous spans using LRFD Specifications; shear studs design for composite action and existing girders deflection calculations for the stage construction. Also, analyzed the existing steel bracket connections and provide recommendations for strengthening the existing brackets; prepared details for brackets strengthening and provided procedure and sequencences for the rivets replacement with high strength bolts for the Contractor. Also, responsible for preparing construction bid documents including Contract plans, bridge construction details, Bridge construction staging plans, supplemental specifications and construction cost estimate for the twenty-two (22) spans of the Structure No. N 7.93W along the NBHCE westbound viaduct. AEA coordinating the proposed design work with GPI and preparing all documents in accordance with NJTA design and procedures manuals. Also, provided construction support services include reviewed shop drawings, prepared responses to RFI and consultation during the stage construction.